Of the many titles that Dave Schell has owned in his eclectic and varied life, those of “Ironman”, “endurance coach”, “chef”, “father of two”, and “husband” are the ones that he is most proud of. Ten years ago, Dave’s life was very different. He was working a desk job he hated, living an unhealthy lifestyle, and weighing in at an all-time high of 220 lbs. In 2003, he quit his desk job and went to culinary school at Johnson & Wales University, after which he worked in several restaurants and ran his own personal chef business. Around this time, Dave started running. A healthy new outlook on his fitness and diet led him to shed over 60 lbs, and he ran his first race in 2007 at the Bolder Boulder. That day, he came to realize that his limits may be further than what he ever thought. And he made up his mind to see just what they were. Today, Dave is an accomplished age group triathlete, holding several top 10 AG finishes in 70.3, Olympic and sprint distance triathlons, as well as the proud title of Ironman. He’s also a triathlon and cycling coach, who is dedicated to helping other motivated athletes to have breakthrough performances. Dave’s coaching accomplishments include having coached his athletes to a collegiate national mountain bike championship, a podium finish at the Colorado State Championships in cyclocross, and a top 20 finish at the USA Cycling professional cyclocross National Championships. Dave is an a USAC Certified Level 3 Coach. 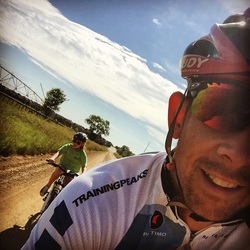 In addition to coaching, Dave works full-time at TrainingPeaks, helping other endurance athletes and coaches learn how to use the company’s training solutions. In particular, Dave specializes in educating coaches on WKO+ software for in-depth power analysis. Dave has written training articles for TrainingPeaks and Ironman.com. He’s also been quoted on Triathlete.com and 303cycling.com. That’s a nice story. But what’s it like to have Dave as a coach? Engaged: “Dave genuinely cares. You’ll get attention and thought put into your program—not just a dynamic training plan.”. Who is "Famous Bob Davis"? Dave's held a lot of jobs in his time. At one point, he was a housekeeper in a local hospital. His name tag read, "Dave S." Soon after, he was only referred to as "Davis", which over time gave way, rather inexplicably, to Bob Davis. When he asked, "Who is Bob Davis?" he was told, "A very famous...something." Thus the legend was born, and stuck: Famous Bob Davis. Is Dave seriously so full of himself that he wrote this entire page in third person? No. Dave is such a great coach, he was actually able to convince someone else to write this bio for him! He typically avoids talking about himself in third person, at least on weekdays.